The recent local TV buying spree by companies such as Gannett and the Tribune Company has reinforced the notion that in a challenging media environment, local television stations are commodities that will help newspaper groups gain needed revenue. While these stations have been bolstered by a political advertising windfall and growing retransmission fees, local television also faces some worrisome audience and economic trends. The latest data to shed light on local television economics comes from the new RTNDA/Hofstra University annual surveys of television newsrooms. The results offer some mixed messages. On the one hand, local TV news remained profitable and newsroom budgets grew in 2012. On the other hand, the data revealed fewer newsrooms, smaller staffs and shrinking salaries in 2012. • Advertising within news programming accounts for an increasing portion of local TV station revenue. One trend that shows no sign of reversing is the increasing contribution of news to local station revenue. Revenue from local news hit a record 48.6% of total station revenues in 2012, according to the RTDNA/Hofstra survey of news directors. • Local TV newscasts are profitable and budgets in newsrooms have grown. About two thirds (66%) of news directors said their stations made a profit on news in 2012, the highest percentage since 1994 when that data was first available. 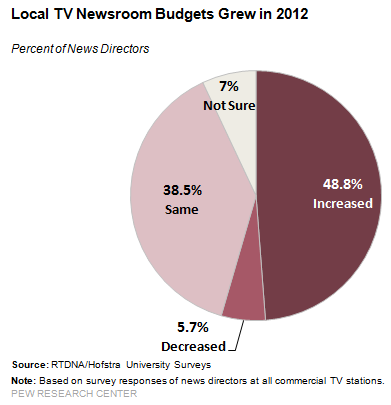 In the vast majority of TV newsrooms, budgets either grew (49%) or held steady (39%) in 2012. Only 6% of news directors said they had to make cuts, compared with 17% the year before. • There were fewer newsrooms in 2012. According to the survey, 717 local stations produced local news in 2012, down eight stations from the year before. Overall, the number of news-producing stations has dropped 8% from 2005, when it peaked at 778 stations. • The median full-time staff dropped in 2012. 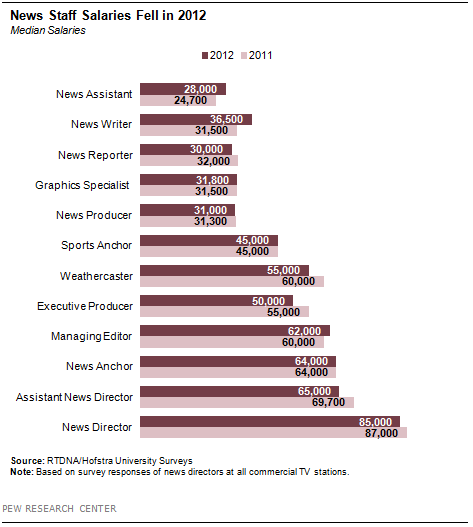 According to the survey, the median newsroom size was 31 full-time employees in 2012, down from a record of 32 in 2011. As was the case the year before, much of the hiring was in the largest markets, where the median staff was 76, up 9% from 2011. In smaller markets, staff size in 2012 dropped to 19 (down 10%) from 2011 levels. • Newsroom salaries fell in 2012. Overall, television news salaries fell about 2%, the same percentage they gained in 2011. News writers and news assistants enjoyed the biggest gains—16% and 13% respectively—from 2011. Top news managers lost ground. News directors’ salaries were down 2.3%, assistant news directors’ salaries were down 6.7% and executive producers’ dropped 9.1%. Salaries of news and sports anchors remained the same.